Two girls, Sophie and Agatha, have been friends all their life, but no two friends could be more different. They were practically exact opposites. For example, Sophie likes pink, while Agatha likes black. Sophie does a two-hour grooming routine each morning, but Agatha couldn't care less. Sophie believes in the fabled School for Good and Evil; Agatha thinks it's a myth. Sophie and Agatha live in Gavaldon, a small village surrounded by woods, and every four years, something comes out of those woods, takes two children, and runs off. It started 200 years ago, and in those 200 years, the villagers have noticed a pattern. One of the two children is always good-natured and good-looking, while the other is selfish and ugly. In other words, one was Good, the other Evil. Later on, those same children (the ones who were taken) appear in fairy tales, as heroes and villains. "The only way out of a fairy tale... is to live through it." After the little mix-up, Sophie finds out that while she always thought she had been good, there is a darkness in her soul that, as the story progresses, grows and takes control as she tries harder and harder to convince people that she is in fact Good; she feels betrayed, angry, and upset that she has been placed in the “wrong” school, and the angrier she gets, the more the anger changes her. Agatha may have appeared to hate everyone, but she hasn’t really given herself the chance to see the Good in herself. Maybe they are in the right schools after all? Both of them have always seen themselves as what was on the surface, so when they find out who they really might be, it surprises them. Being in the “wrong” school helps them see themselves for how they truly are, not how they think they are, which is hard for most to do. But solving any problem has its price. Sophie’s and Agatha’s friendship is in danger. Sometimes, Agatha thinks that their friendship never even existed. Intriguing, isn't it? And just because this book has something to do with fairy tales doesn't mean that this book is for 5-year-old girls. I mean, this book is close to 500 pages long. There is some violence, so this book wouldn’t be recommended for kids who easily get nightmares. At one point, the students from both schools clash and almost start a war. But this book has a little bit of everything: friendship, trust, a little bit of love, but also a bit of fear, sadness, betrayal, and of course, fighting. 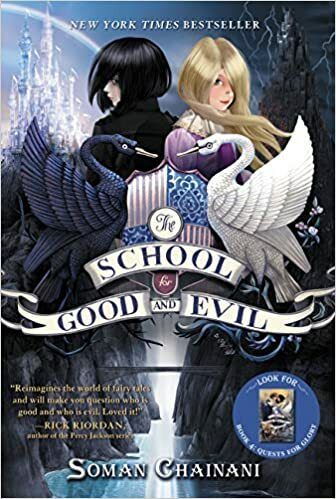 Mix it all up, let it simmer in a Crock-Pot, and you have this book: The School for Good and Evil, where fairy tales come to life. Daddy's afterthoughts: I don't have much to add. Yet another fairy tale/magical school/alternate world trope-fest, although like Adam Gidwitz's Grimm series that Julia reviewed book one of some time ago, this one flirts with the dark side a bit. I would, however, direct parents to this NPR article, with its interesting insights into the book's young author and his vision for the series, now several books long. The article itself is specifically focused on the fourth book ( I think) in the series, but the overview is general, and will give you a good sense of what is going on in the series as a whole. As far as trope-filled it's-been-done-before series goes, this one looks like a good 'un. This is one of my daughter's favorite book! She's thrilled to know there are more to the series. Thanks, Julia!